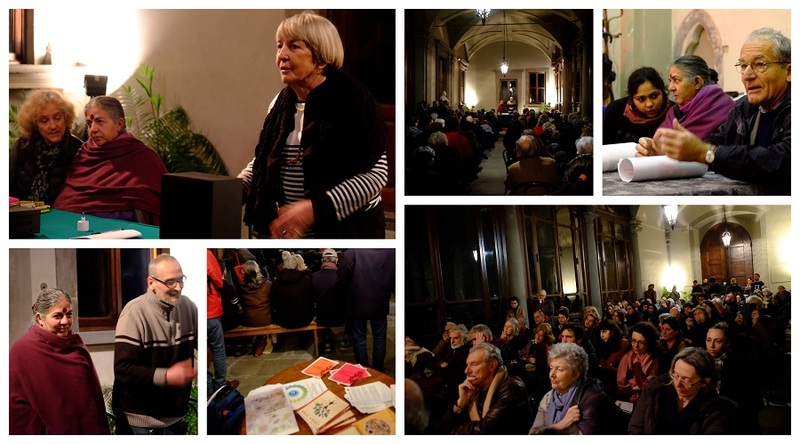 Corporate strategies aimed at appropriating common goods were the subject of a series of conferences and debates with Dr. Vandana Shiva, held in Florence at the end of January 2018 and organized by Navdanya International in collaboration with local partners. On 27 January, Vandana Shiva talked about “Responsibility and Environment”, in the context of the event series “Sulla scia dei giorni” (In the Wake of Days) in the city’s Teatro Niccolini, conceived and promoted by Fondazione Cassa di Risparmio di Firenze, under the auspices of the Region of Tuscany, the Municipality of Florence, the University of Florence, in collaboration with Teatro Niccolini and Fondazione File. She pointed out how everyone has a duty to take care of the Earth and its resources. “Making peace with the Earth” is the commitment we must make to implement the attendant ecological solutions, those of caring for the soil, seeds and biodiversity as the essential basis for solving most of the crises we are facing: environmental, food, health and climate change. Those who suffer and will suffer the most from the problems created by the current economic and agricultural/food models are the most vulnerable and the youth, who are becoming more and more aware of the fact that the tools for change are in their hands and that they can be at the forefront in stopping the current race to the destruction of the fragile balance of our ecosystem. The following day, 28 January, Dr. Shiva gave a Lectio magistralis on “Earth Democracy” at the Odeon Cinema, organised in collaboration with Cinema Odeon Firenze, Le Piagge editions, Terra Nuova and LEF Libreria Editrice Fiorentina. 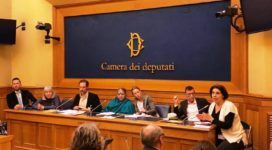 Vandana Shiva underlined the schism between politics, which should be in the interests of citizens, and the present economic unsustainable and exploitative model. In the Global South, this model has been promoted with terms such as “structural adjustment” and “free trade”, while in Europe the term “austerity” has been used. It is a model which undermines the power of the people, leaving citizens increasingly impotent, unable to protect their land and livelihoods. It is a system that creates economic insecurity and uses the “fear” of the “other” as a means to ensure electoral success. 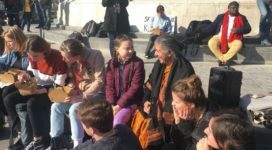 Dr. Shiva invited people to say no to the dominant political system and the current economic model and to join and act together to create a system of circular economies, where organic and ecological agriculture becomes the foundation for the regeneration of soil, biodiversity and human dignity. On 30 January, a meeting titled “Profits of corporations are poisoning food, Earth, the Planet. 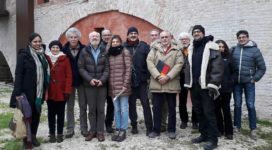 What is the alternative?” was held in the atrium of Palazzo Budini Gattai, and organized in collaboration with perUnaltracittà and Spazio Inkiostro. Among the issues discussed, specific focus was given to the impact of globalization, which has progressively reduced the commons, including seeds and food, into commodities at the mercy of market fluctuations. The essential role of large corporations in this process was highlighted and the consequences that impact directly the lives of people and farmers and the environment. Over the last decades, this economic system has enabled a handful of billionaires and the corporations they control to interfere in national laws which protect the right to health and a healthy environment, to dismantle the dignity of work, and to obstruct long-held democratic processes. Vandana Shiva recalled how in 1999 the movements in Seattle were able to stop the World Trade Organization’s agenda and programme, and at the same time how corporations continue to implement new tricks and strategies, such as free trade agreements and creating increasingly large monopolies as a result of corporate mega-mergers. Their aim to they take control of natural resources, food and agriculture systems and invade national markets with imported products that destroy the fabric of local economies. Among the rules “written by corporations” and imposed by WTO, Dr. Shiva emphasized those rules related to intellectual property rights, which have allowed patents on life, and favored hugely the expansion of chemical and seed industries in the field of genetic engineering, producing an exponential increase in these markets and in mono-cultures at a global level. The consequences of the industrial model of agriculture are known. It is a system that is destroying biodiversity, soil, water resources, while contributing to only a small part of the food produced globally. 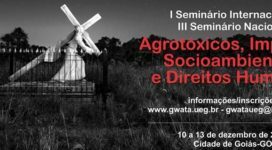 It is still small farmers who provide most of the global food needs, in spite of not being protected by the current system, which prefers to favour the distribution of low cost and nutritionally empty agricultural and food products, often loaded with a wide range of chemicals dangerous to health. Dr. Patrizia Gentilini of ISDE Association of Doctors of the Environment, stressed the close and clear link between people’s health and the environment and how this principle has yet not been fully assimilated by the medical and scientific community. Based on her experience, Dr. Gentilini has noticed an increase of cancer cases in younger and younger people. The statistical data about the Italian situation tell us that in a lifetime one man out of two and one woman out of three are destined to be given a diagnosis of cancer. The presence of a wide quantity of dangerous chemicals in the environment and in our food are also linked to a number of other diseases: metabolic disorders, neurodegenerative diseases, infertility. Especially alarming are the damages to the developing brain and the increase in cases of children with cognitive delay of various kinds. Faced with this scenario, there are serious shortcomings at the regulatory and institutional level, as seen in the risk assessment process on glyphosate which resulted in a further approval of the use of the substance in Europe for another five years, in spite of the clear corporate interferences and questionable, if not criminal, behaviours of production businesses.